Golf Vita residential towers at Damac Hills. 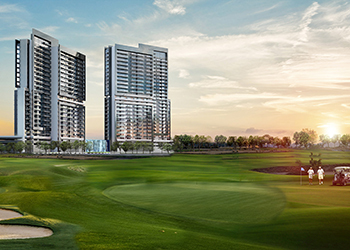 Damac Properties has launched its Golf Vita Residential Towers apartments at Damac Hills in Dubai, that offer panoramic golf course views for each unit. The leading luxury real estate developer is offering one- and two-bedroom luxury apartments, starting at Dh499,000 ($135,856) with an attractive payment plan of Dh4,990 per month ($1,358) for 30 months after the initial 20 per cent deposit, the company says. The remaining is to be paid on completion. Meanwhile, Dubai-based Damac Properties has also unveiled its new Trump-branded villas at its Damac Hills master community. The Trump Estates Park Residences is set within a well-established golf community. Four-bedroom villas will be priced from Dh2.96 million ($805,000) with a complimentary three-year family membership at the Trump International Golf Club Dubai. The two-storey villas come with a lower ground floor, private yard, separate living/dining area and kitchen and access to the world-class amenities of Damac Hills.